Posted By PA Breast Cancer Coalition on June 16th, 2014 at 8:48 am | 208 comments. Hundreds of batters and volunteers packed Metro Bank Park this part Tuesday to Take a Swing Against Breast Cancer® with the PA Breast Cancer Coalition. 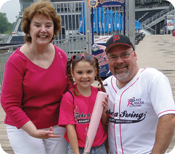 Home runs were recorded and thousands of dollars were raised to strengthen our support network for breast cancer survivors, their families and caregivers across the state. Not to mention, we had a blast! With the help of our volunteers, batters and sponsors, the PBCC is able to provide women with the resources and comfort they need at a most difficult time in their lives. There’s still time to join us and make a difference! Our next stop is Lancaster at the home of Barnstormers baseball on Saturday, June 21. Derby season wraps up Saturday, August 23 at Jerry Uht Park in Erie. 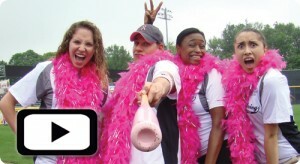 Knock one out of the park with us as we Take a Swing Against Breast Cancer this summer. 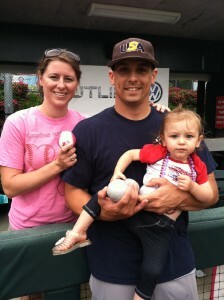 For scores from the Harrisburg home run derby, click here. 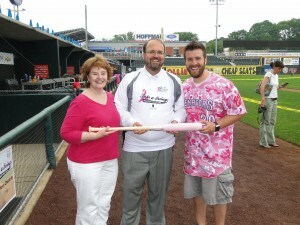 To check out our photos from the Harrisburg Home Run Derby, click here. Posted By PA Breast Cancer Coalition on June 16th, 2014 at 8:46 am | 7126 comments. Survivor Darci Baird smiles for a picture with her 2-year-old granddaughter Ava. Cancer is not a death sentence. I’ve learned that. The word is scary but it’s the word for a disease that can be beaten. You just have to face it, figure out your treatment plan, and go about the business of kicking cancer to the curb. 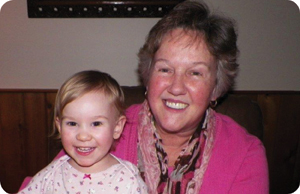 I was 49 years old in July 2009 when a routine mammogram found my breast cancer. I had a lumpectomy and then radiation and am now finishing up. This is my fifth year of taking Anastrazole (Arimidex). I always thought I was strong but I learned just how strong I was, and how strong my faith was. I am 100% positive that I had the help of Christ to get me through breast cancer. I wouldn’t have come through without the prayers of so many people. During one of my many office visits after diagnosis I saw some literature and I asked Helen Harshbarger if she thought the PBCC was worth my time. Helen said the PBCC is absolutely the grassroots organization you want to become connected to. I ordered a Friends Like Me care package for myself and getting all that wonderful information really solidified all the good things that Helen had told me. 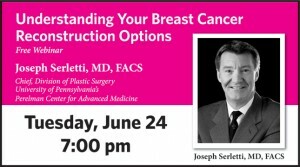 Two years ago Robert Packer Hospital and Guthrie Healthcare were getting ready to host “67 Women 67 Counties: Facing Breast Cancer in Pennsylvania” and they asked me to help with that. That was a great experience. About that time the movie Iron Lady about Margaret Thatcher came out. We decided to do a fundraiser with the theme that anyone who has survived breast cancer is an iron lady, so we put together the Iron Ladies Night Out. We had a commemorative stone inscribed for iron ladies past and present and laid it in front of the theatre in Sayre. We had the help and support of Marge Ross who runs the theatre and is a force of nature with a tremendous heart. I’m fortunate to live in such an awesome community. My husband John was there by my side with whatever I needed, and my kids were too. Amanda and Tim are young adults but it’s still a shock when mom gets sick. My brother cooked for me even after I was back on my feet. Cancer can make the people around you feel so powerless, and I think that made him feel like he could do something. My granddaughter Ava Rose Baird turned two years old in May and she is one of the reasons I fight so hard to help find a cure for breast cancer. Posted By PA Breast Cancer Coalition on June 16th, 2014 at 8:46 am | 1247 comments. Researchers at the Cleveland Clinic say they have found a drug that shows promise in protecting fertility among cancer survivors. Goserelin, which is commonly used in hormonal therapies to treat breast and prostate cancers, is also used in fertility clinics to control ovulation. How does it work? According to this recent study, goserelin has been proven to prevent women from entering premature menopause that can be caused by chemotherapy. Researchers found that women who were given goserelin injections along with chemotherapy had less ovarian failure and gave birth to more babies than women who only received chemotherapy. Two years after starting chemotherapy, only 8% of women who received the monthly goserelin injections during chemotherapy experienced ovarian failure, compared to 22% of those with chemotherapy who did not receive the injections. It was noted that this study only included women who had hormone-receptor-negative cancer, because many women with hormone-receptor-positive cancer typically receive the drug tamoxifen, which can cause a loss in menstruation. Currently, the most common option for breast cancer patients to increase their chances of conceiving is to freeze their eggs, which is an invasive procedure that can cost $10,000+. Once-a-month injections of goserelin during chemotherapy would serve as an alternative, costing about $500-$600 per shot. Experts say, while the research shows positive results, the drug does come with side effects. Survivors may experience a temporary postmenopausal state along with hot flashes and other symptoms. Still, scientists say they also noticed an unexpected finding of the study: women who received goserelin had a lower risk of dying after four years. They say there is still not enough data to recommend this drug be used to treat cancer, but the results show goserelin will not worsen cancer outcomes if used to protect fertility. Posted By PA Breast Cancer Coalition on June 16th, 2014 at 8:45 am | 252 comments. 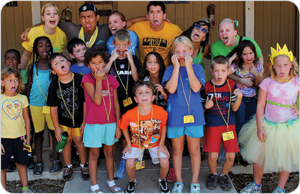 Camp Kesem, a summer camp for kids with a parent who has (or has had) cancer, is now accepting applications! The one-week sleep away camps are a chance for children ages 6-16 to have a fun-filled week and just be kids. Everything at Camp Kesem focuses on the goal of giving campers the best week of their lives, while providing the extra support and attention they need. Posted By PA Breast Cancer Coalition on June 16th, 2014 at 8:44 am | 197 comments. 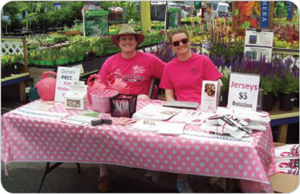 Pink Day at Stauffers of Kissel Hill Garden Centers was a blossoming success as folks filed in to grab their gardening essentials on a beautiful spring day. At each of their 8 Central PA locations, Stauffers offered 2% of sales as a donation to the PBCC, gave away free watering cans to anyone who made a contribution, and held an employee bake-sale to raise money. In addition, PBCC staff and volunteers were on-hand to offer free resources, information and breast cancer materials. This year’s Pink Day raised an amazing $8,377.80! The event at Stauffers has raised more than $24,000 since its inception in 2012! Special thank you our friends at Stauffers of Kissel Hill for planting the seed and growing a great awareness event for the PBCC! Posted By PA Breast Cancer Coalition on June 12th, 2014 at 9:16 am | 1355 comments. Team Hakuna MaTaTa raised more than $3,600 for the PBCC! 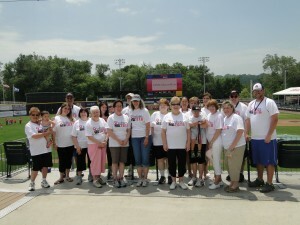 The 7th annual Take a Swing Against Breast Cancer® Home Run Derby kicked off in Harrisburg at Metro Bank Park on June 10th with nearly 100 batters, countless volunteers, and a stadium full of supporters. The fight against breast cancer was in full force with Team Hakuna MaTaTa raising $3,623, earning the title of Top Fundraiser! Five talented batters were awarded for their high scores! Jody Roof impressed with four home runs and a total score of 625 points; Burt Stormes knocked one out of the park and earned a total of 425 points; Bret Wagner also hit one homer and earned a total of 375 points; Brian Zellers racked up 375 points with two home run balls; and John Furlong rounded out our top five hitters with 350 points!